Melanie Titus' first foray into macrame was an experiment. A portrait photographer and interior decor junkie, she taught herself how to tie the throwback knots for a photoset just over a year ago. "It started out as 'I want to try this and see if I can do it and I realized that I kind of think of it as a self-care thing. It's pretty meditative," she says. "It's done a lot for me personally, I get artistic fulfilment I wasn't getting any more from photography." She had no intention of selling her work until people started asking. And so Little Queen Handmade—and its 'nostalgic wall art and plant hangers'—was born. 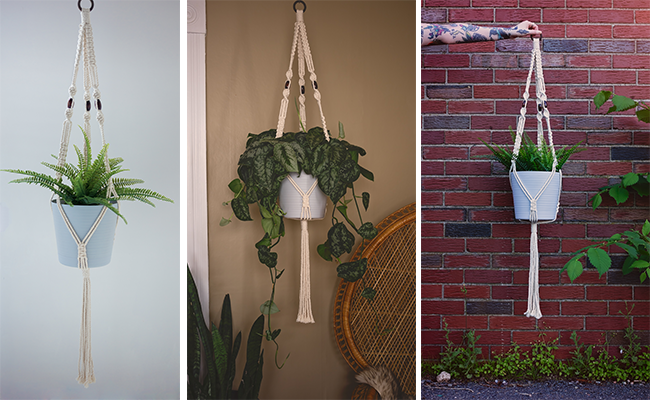 Titus has been making her rounds in the craft show world (next up will be September's Maritime Makers) but mostly sells her work—like the pictured Nina plant hanger, $40—via her website, littlequeenhandmade.com, for now. She hopes to make her way into some local shops this fall. "The thing about photographs is we're so inundated with them. You scroll through things and people barely pay attention to an image," she says. "I wanted to create something a little more lasting."